Zarfund monthly subscription payments are what every Zarfunder should get to understand. Many join the program and get to find out about Zarfund monthly subscription payments after they started getting the email notification from Zarfund. Then they begin to fret. But is there really a cause for alarm? NO! and this article will tell you why. Before we go into the nitty-gritty of Zarfund monthly subscriptions, you may want to check out the complete Zarfund review, step-by-step picture and video guide. Like every serious business minded person, there are basics you will need to know about Zarfund. Now, here is what you need to know about monthly subscriptions in Zarfund. In the first place, ZarFund is a Monthly subscription peer-to-peer Bitcoin payment platform. It is the monthly payments sent and received that gives the program its residual income effect. If everyone were to just make one payment, the program would not be as robust as it is. Therefore, when you upgrade to a particular level, you are creating a monthly subscription for that level. However, just as you would have monthly subscription payments to pay, you will also have those below you, who will make monthly subscription payments to you. This is how the ZarFund program is designed to work! Please see the “Zarfund FAQs” page. Your ZarFund Bronze monthly subscription is set to expire on 18-Nov-2016 22:54:01. If this subscription expires, you will no longer receive donations at this stage. Upgrade today to keep receiving Bronze stage donations. When you click on that button the system will give you to the person to pay. So, for example, when you upgraded to Level 1 (Bronze), you created a subscription where you will send the same payment every 30 days, to your Direct level 1 Upline, if they are qualified… and if they are not, your monthly subscription payment will bypass them and go up to the next qualified upline member. However, you should also be receiving the same subscription payments from the 2 people on your level 1 in your matrix, each month. You are only creating a monthly subscription for the levels you have upgraded to. 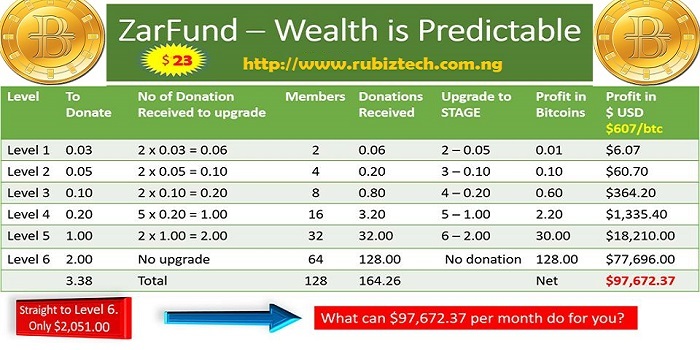 Therefore, there is NO difference between an Upgrade to the Next Level and the Monthly Subscription Payment. You can decide not to make your monthly subscription payment, for any level. However, as long as you have any subscriptions that are in the “Arrears”, you will not receive ANY payments for that particular level. Once you pay for your subscription, even after it has expired, you can start receiving payments again. The due date for your monthly payments will always be 30 days from the date you joined. For Example, You joined on September 3rd, your next monthly payment would be due 30 days after that date, on October 4th and the next monthly payment would be due on November 5th, and so on. Whether you pay early, once the “Pay Now” button appears or your subscription expires and you pay late, the 30-day schedule will never change. And as long as you have made at least 1 payment, your account will not be deleted. The system is fair to everyone. There is no pressure to keep a level if you are not receiving payments on that level yet. But you should keep an eye out on your downline so that you don’t get skipped once your downline is ready to make a payment to you. Zarfund no doubt is Teamwork but the monthly Zarfund subscription payments which are meant to sustain the system has been a big threat to participants. If you visit Jordan Hannes’ Facebook group, Zarfund monthly subscription is the talk of the day, every day. This has made the Zarfund CEO to announce: I hope to have exciting changes added to the system in January that will make you smile and have you busier than ever promoting your favorite program”. The question on everyone’s lip now is: Is the monthly subscription going to the bins? Will subscription become optional and not mandatory so that it won’t kill the zeal of participants? Well, January is just a few weeks away and we are eagerly looking forward to the upcoming changes. Meanwhile, as a team, we are encouraging our members to resubscribe so they don’t miss out in their present level donations due them from their downlines. We engage in RESUB and REFUND strategy where the bitcoin money paid for resubscription by a member is refunded less blockchain charges. If a member is in level 2 for example and resubscribes with 0.05 to his/her upline, he gets 0.04 back. The 0.01 takes care of the blockchain charge and the 0.05 spent by the upline when he/she did her own resubscription at that level. This plan has kept the team together as ONE as we yet grow stronger with ONE GOAL: LEVEL 6, usign other unique strategies. Want to Join Zarfund Team 1.0? Thanks. January is almost here, lets see what it’ll be. I registered a few days back and still learning about the program. In fact, that’s how I found this site. You are welcome, Davin. We are eagerly looking forward to what Jordan Hannes has for all Zarfunders too. Many people need to learn these facts.. so pls share to this article to all Zarfund participants. Level 2 requires that you have 4 downlines. Though Zarfund system says, once you get payments from 2 of them, you should upgrade, I strongly advice you upgrade only when you know your donelines are about paying to you on that level. Once you are unable to get the 4 downlines, you have to resubscribe fro you to be eligible to receive payment for that level. Same 4 persons will pay to you every month as long as your level 2 remains active. If them (4 downlines) becomes inactive for any reason, their lines will be the once paying to you on that level monthly. Hope I got your questions right. Let me know if you have other questions. You may also want to check the “Zarfund FAQs” page.